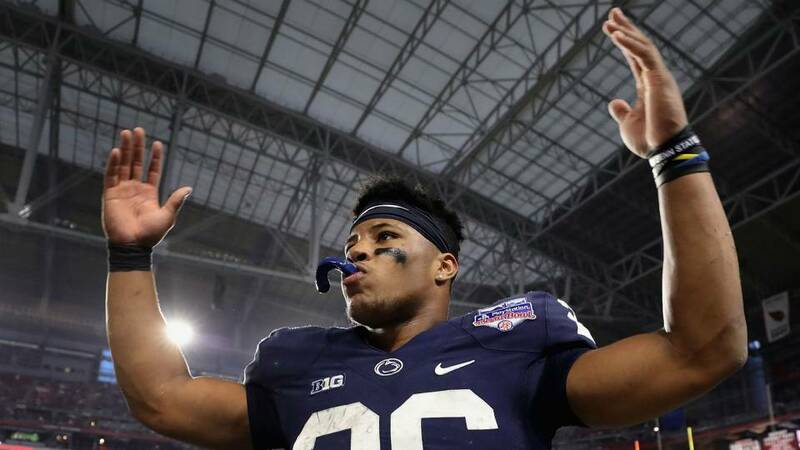 Scouting Report: Saquon Barkley is the clear lead back for the New York Giants this upcoming season. Having just signed his rookie contract, he will be paid $21 million this year, making him the league’s highest-paid running back for 2018. After being selected second overall in the draft, the hype around him is very high and for good reason. Barkley posted over 5000 yards from scrimmage during his three seasons at Penn State and he also accounted for 51 touchdowns. Averaging 5.7 yards per carry and 11.7 yards per catch during college, he is clearly going to be a dual threat in the NFL. Expectations are high and I think he will live up to them. Fantasy Projection: Barkley will be utilized similar to how Arizona uses David Johnson. He finishes as a top-5 running back. 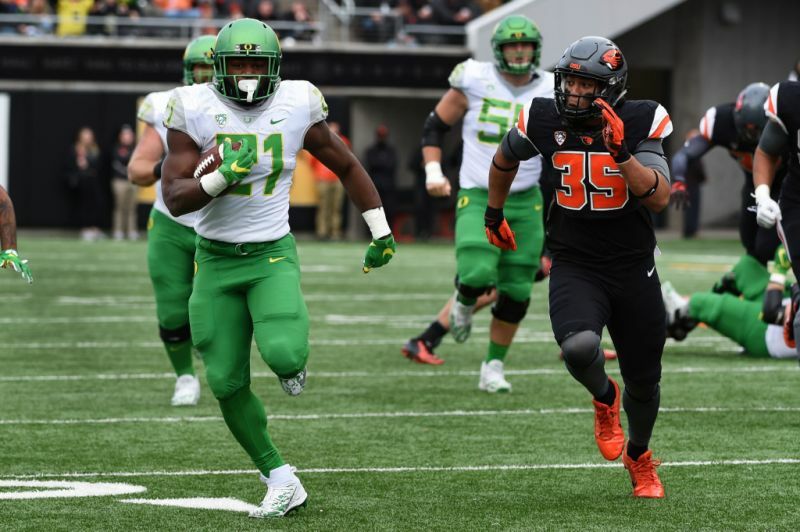 Scouting Report: The Seahawks used their first round draft pick on Penny this year, but they have an abundance of running backs on their roster. Penny played at a smaller D1 college than most running backs on this list, as he attended San Diego State for 4 years. During his senior year he averaged a ridiculous 7.8 yards per carry while also rushing for 2,248 yards and 23 touchdowns. Chris Carson is currently the starter on this roster but Penny has the best shot at beating him out during training camp or the regular season. Assuming he can eventually take the reigns of what has been a very weak run offense the past couple of years, Penny could be a name to take a flier on late in your fantasy draft. Fantasy Projection: He may not start immediately, but when he does, look for consistent production from him. Depending on when he becomes the lead back, he could finish inside the top-25 at his position. Scouting Report: Sony Michel is coming off a great season at the University of Georgia. 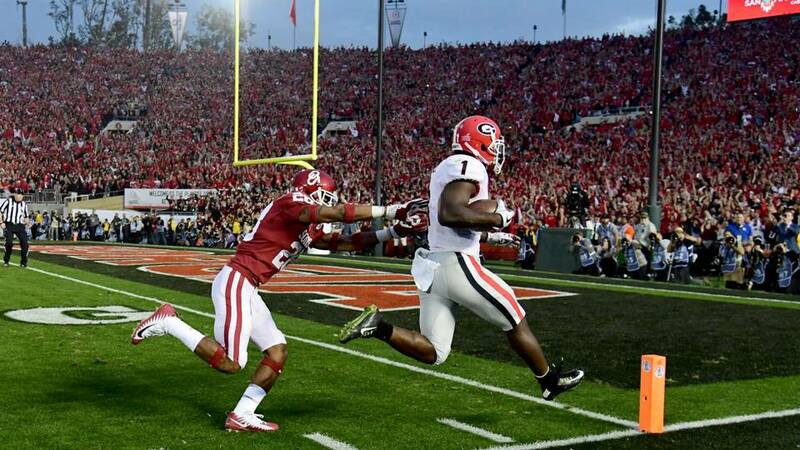 While splitting touches with Nick Chubb, Michel posted 1,227 yards and 16 touchdowns. Michel was mainly competing against close to NFL level talent in the SEC and he still managed to average 7.9 yards per carry. While I usually advise to stay away from Patriots running backs as a whole when it comes to non-PPR fantasy, Michel might be worth taking a flier on. Rex Burkhead had a breakout second half of the season last year, but he’s more of a threat in the passing game than running the ball. The past two seasons we’ve seen the Patriots rely on one consistent ball carrier while spreading out passes to multiple backs. LeGarrette Blount finished seventh at the position in 2016 and Dion Lewis finished 12th last season when looking at non-PPR scoring. Jeremy Hill will be in the mix to become the lead ball carrier, but if Michel can translate his dominating style of running to the pros, he should be able to assume the role for New England this season, thus making him a valuable fantasy asset. Fantasy Projection: He beats out Hill and becomes the Patriots lead ball carrier and he scorers double-digit touchdowns. He finishes the season as a top-25 running back. Scouting Report: Nick Chubb was Cheech to Sony Michel’s Chong last season at Georgia, helping lead their team to the National Championship game. While Chubb had the better career at Georgia, Michel had the better senior season, leading Chubb to slip to the second round of the draft. Chubb will have to compete for carries with Duke Johnson Jr. and the newly acquired Carlos Hyde. Although Hyde has yet to finish a season with over 1,000 yards, he was a fantasy threat last season, finishing ranked 11th at his position in non-PPR formatting. Johnson is more of a receiving back and he’ll handle most of the third down work this upcoming season. While Chubb is likely going to be splitting carries all season with Hyde and Johnson, I don’t see much upside in selecting him for your fantasy teams. Fantasy Projection: Believe it or not, there’s too much talent on the Browns offense for Chubb to have a productive rookie fantasy season. He finishes outside of the top 35 running backs. Scouting Report: Devontae Booker will start the season as the Broncos starting running back, but Royce Freeman should have no problem overtaking him sooner rather than later. Booker has averaged a paltry 3.6 yards per carry through his first two seasons in the NFL. The reason he’ll be starting week one is because of his pass-blocking and receiving skills. Once the Broncos get sick of his lack of burst in the run game, Freeman will become the guy in Denver’s backfield. At Oregon Freeman was a touchdown machine, tallying a total of 60 during his four-year tenure at the school. He also managed to average 5.9 yards per carry through his four years. He has a bruising style of running while also showing patience behind blocks. Freeman should definitely be the running back to own on the Broncos in fantasy. Scouting Report: Ronald Jones had an astounding season last year at USC. He totaled 1,737 yards from scrimmage and had 20 total touchdowns. With Doug Martin now in Oakland, Jones will have a chance to become the lead back for Tampa Bay. While I think Jones has the talent level to eventually takeover this backfield, there’s not much upside in owning a Buccaneers running back. With Jameis Winston set to miss the first three games of the season they’ll be turning to Ryan Fitzpatrick to fill in. Tampa Bay is also in a stacked division with the Saints, Falcons, and Panthers. Seeing as the Bucs are destined to finish fourth in their division and they’ll mainly be playing from behind most of the season, I personally don’t want to own any of their running backs in fantasy. Fantasy Projection: He’ll show signs of whats to come in future seasons, but the Bucs won’t be competitive enough for consistent fantasy production. He finishes outside of the top 30 running backs. Scouting Report: Kerryon Johnson is one of the least talked about running backs on this list. That’s hard to believe considering last season he led the SEC in rushing yards and he finished second in touchdowns even while missing two games due to injury. With Detroit hiring Matt Praticia as their new head coach, they will surely be focusing on improving their run game. The last 100-yard rushing performance the Lions have had was Reggie Bush in 2013. There are a lot of names fantasy owners should recognize on the Lions depth chart, but none with the upside of Johnson. Theo Riddick is a career third-down back, being used primarily as a receiver. LeGarrette Blount is two seasons removed from scoring 18 touchdowns, but only scored twice last season for the Eagles. Ameer Abdullah has never lived up to the hype surrounding him. All of these backs don’t have much upside that will translate to improving the Lions run game. Johnson should be able to take ahold of Detroit’s backfield rather early into the season. The Lion’s running backs coach David Walker has already classified Johnson as a three-down player, saying he can play in all situations. If Johnson can truly pass-protect, catch the ball out of the backfield, and maintain being an efficient runner, he could be the key to the Lion’s run game this season. He could also become an asset to own in fantasy, meaning he would be worth a late-round flier in fantasy drafts. Fantasy Projection: The Lions will give Blount and Abdullah early in the season but eventually turn the backfield over to Johnson. He finishes inside the top 30 running backs. 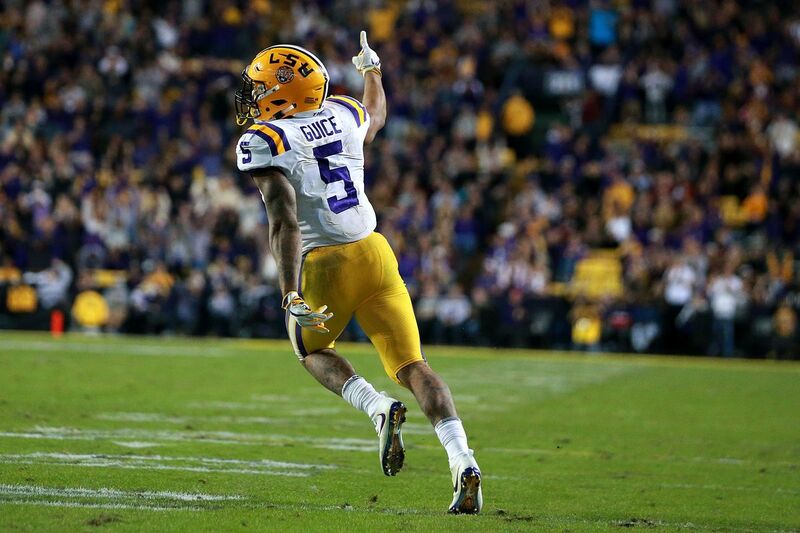 Scouting Report: Outside of Saquon Barkley, Derrius Guice is projected to be the top rookie running back in fantasy this upcoming season. I’m a little more skeptical on Guice’s outlook. The Redskins have arguably one of the deepest running back corps in the NFL. Samaje Perine had a decent rookie season last year but only due to injuries to Chris Thompson and Rob Kelley. Thompson was on pace for a career year last year averaging career highs in rushing and receiving yards per game. While Thompson is more of a receiving back, Rob Kelley is the lead back. Kelley was injury riddled all of last season before eventually getting shut down after week 10 because of an ankle injury. With all the running backs competing for the starting job, Guice has a lot to overcome. He may have the talent to become the starter eventually, but I don’t see it happening early in the season unless there is an injury. I wouldn’t draft him where he is currently projected, as the 17th overall running back in non-PPR formatting. Fantasy Projection: He’ll start the season at third string, but he’ll have a big second half of the season once he takes over the backfield. He finishes outside of the top 25 running backs. Scouting Report: Nyheim Hines was actually a wide receiver his first two years at NC State before becoming a full-time running back his last year in college. In his first and only season as a running back, he posted impressive stats of 1,113 yards and 12 touchdowns while averaging 5.6 yards per carry. Outside of Saquon Barkley, Hines is arguably the best rookie running back at catching the ball out of the backfield. He also has track speed, being able to run a 4.38 second 40-yard dash and a 10.34 second 100-yard dash. What Hines lacks in size, he stands 5’8’’ 198 pounds, he makes up for it with incredible athleticism. Marlon Mack will enter the season as the Colts lead back, but if he struggles early on, Hines will get the chance to assume the role. Hines is the hardest running back to project due to his lack of experience at the position. I think he has the talent level to become the full-time starter and he could have a big second half of the season, but I wouldn’t select him until the end of your fantasy drafts, if you should select him at all. Scouting Report: With Kenyan Drake finishing off last season strongly, it will be hard for Kalen Ballage to find many touches in the Dolphins backfield. Miami also added veteran Frank Gore to their group of running backs, so Ballage will start the season as their third string back at the very best. Ballage didn’t have very impressive numbers in college, averaging 4.4 yards during his four years at Arizona State. I definitely don’t think Ballage will be worth owning unless injuries derail Drake and Gore. Fantasy Projection: Best-case scenario, he becomes Drake’s backup. He will finish outside of the top 50 running backs.